For other uses, see IFE (disambiguation). Ife (Yoruba: Ifè, also Ilé-Ifẹ̀) is an ancient Yoruba city in south-western Nigeria. The city is located in present day Osun State. Ife is about 218 kilometers northeast of Lagos with a population of 509,813. According to the Yoruba religion Ife was founded by the order of the Supreme God Olodumare to Obatala and then fell into the hands of his brother Oduduwa, which created turmoil between the two. Oduduwa created his own dynasty through his sons and daughters that became different rulers of many kingdoms. The first Oòni of Ife is a descendant of Oduduwa, which was the 401st Orisha. The present ruler since 2015 is Oba Adeyeye Enitan Ogunwusi Ojaja II, Ooni of Ife who is also a Nigerian accountant. Named as the city of 401 deities Ife is home to many worshipers of these deities which also are celebrated through festivals. Along with the culture of Ife, their beliefs extend along the concept of the Ase, which help make art of the Kings and Gods. 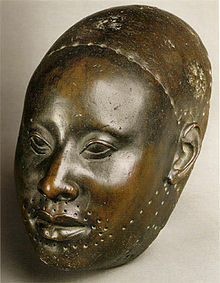 Ilé-Ifè is famous worldwide for its ancient and naturalistic bronze, stone and terracotta sculptures, dating back to between 1200 and 1400 A.D.
Yoruba Copper mask for King Obalufon, Ife, Nigeria c. 1300 C.E. According to Yoruba religion, Olodumare, the Supreme God, ordered Obatala to create the earth, but on his way he found palm wine which he drank and became intoxicated. Therefore, the younger brother of the latter, Oduduwa, took the three items of creation from him, climbed down from the heavens on a chain and threw a handful of earth on the primordial ocean, then put a cockerel on it so that it would scatter the earth, thus creating the land on which Ile Ife would be built. Oduduwa planted a palm nut in a hole in the newly formed land and from there sprang a great tree with sixteen branches, a symbolic representation of the clans of the early Ife city-state. The usurpation of creation, by Oduduwa, gave rise to the ever-lasting conflict between him and his elder brother Obatala, which is still re-enacted in the modern era by the cult groups of the two clans during the Itapa New Year festival. On account of his creation of the world, Oduduwa became the ancestor of the first divine king of the Yoruba, while Obatala is believed to have created the first Yoruba people out of clay. The meaning of the word "ife" in Yoruba is "expansion"; "Ile-Ife" is therefore in reference to the myth of origin as "The Land of Expansion". Oduduwa had sons, daughters, and a grandson, who went on to found their own kingdoms and empires, namely Ila Orangun, Owu, Ketu, Sabe, Popo and Oyo. Oranmiyan, Oduduwa's last born, was one of his father's principal ministers and overseer of the nascent Edo empire after Oduduwa granted the plea of the Edo people for his governance. When Oranmiyan decided to go back to Ile Ife, after a period of service in Benin, he left behind a child named Eweka that he had in the interim with an indigenous princess. The young boy went on to become the first legitimate ruler of the second Edo dynasty that has ruled what is now Benin from that day to this. Oranmiyan later went on to found the Oyo Empire that stretched at its height from the western banks of the river Niger to the Eastern banks of the river Volta. It would serve as one of the most powerful of Africa's medieval states, prior to its collapse in the 19th century. The Oòni (or king) of Ife is a descendant of the godking Oduduwa, and is counted first among the Yoruba kings. He is traditionally considered the 401st spirit (Orisha), the only one that speaks. In fact, the royal dynasty of Ife traces its origin back to the founding of the city more than ten thousand years before the birth of Jesus Christ. The present ruler is His Imperial Majesty Adeyeye Ogunwusi. The Ooni ascended his throne in 2015. Following the formation of the Yoruba Orisha Congress in 1986, the Ooni acquired an international status the likes of which the holders of his title hadn't had since the city's colonisation by the British. Nationally he had always been prominent amongst the Federal Republic of Nigeria's company of royal Obas, being regarded as the chief priest and custodian of the holy city of all the Yorubas. In former times, the palace of the Ooni of Ife was a structure built of authentic enameled bricks, decorated with artistic porcelain tiles and all sorts of ornaments. At present, it is a more modern series of buildings. The current Ooni, Oba Adeyeye Enitan Ogunwusi Ojaja II, Ooni of Ife, (born October 17, 1974) is a Nigerian accountant and the 51st Ooni of Ife. He succeeded the late Oba Okunade Sijuwade, who had died on July 28, 2015. Ife is well known as the city of 401 deities. It is said that every day of the year the traditional worshippers celebrate a festival of one of these deities. Often the festivals extend over more than one day and they involve both priestly activities in the palace and theatrical dramatisations in the rest of the kingdom. Historically the King only appeared in public during the annual Olojo festival; other important festivals here include the Itapa festival for Obatala and Obameri, the Edi festival for Moremi Ajasoro, and the Igare masqueraders. Bronze Head from Ife, probably a king and dated around 1300 C.E., in the British Museum. Terracotta head from Ife, probably a king, 12th to 15th Century C.E., in the Ethnological Museum of Berlin. Kings and Gods were often depicted with large heads because the artists believed that the Ase was held in the head, the Ase being the inner power and energy of a person. Both historic figures of Ife and the offices associated with them are represented. 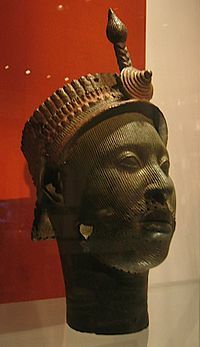 One of the best documented among this is the early king Obalufon II who is said to have invented bronze casting and is honored in the form of a naturalistic copper life-size mask. The city was a settlement of substantial size between the 12th and 14th centuries, with houses featuring potsherd pavements. Ilé-Ifè is known worldwide for its ancient and naturalistic bronze, stone and terracotta sculptures, which reached their peak of artistic expression between 1200 and 1400 A.D. In the period around 1300 C.E. the artists at Ife developed a refined and naturalistic sculptural tradition in terracotta, stone and copper alloy - copper, brass, and bronze many of which appear to have been created under the patronage of King Obalufon II, the man who today is identified as the Yoruba patron deity of brass casting, weaving and regalia. After this period, production declined as political and economic power shifted to the nearby kingdom of Benin which, like the Yoruba kingdom of Oyo, developed into a major empire. The main city of Ife is divided into two local government areas: Ife East, headquartered at Oke-ogbo and Ife central at Ajebandele area of the city. Both local governments are composed of a total of 21 political wards. The city has an estimated population of 355,813 people. ^ "World: Africa Arrests after Nigerian cult killings." BBC. Monday July 12, 1999, Retrieved on October 31, 2011. ^ Bascom, Yoruba, p. 10; Stride, Ifeka: "Peoples and Empires", p. 290. ^ Akinjogbin, I. A. (Hg. ): The Cradle of a Race: Ife from the Beginning to 1980, Lagos 1992 (The book also has chapters on the present religious situation in the town). ^ Olupona, 201 Gods, 94. ^ Blier, Suzanne Preston. "Art in Ancient Ife Birthplace of the Yoruba" (PDF). Academia.edu. African Arts 2012. Retrieved April 7, 2015. ^ Olupona, 201 Gods, 144-173; Lange, Ancient Kingdoms, 347-366; idem., "Preservation", 130-1. ^ Walsh, "Edi festival", 231-8; Bascom, "Olojo", 64-72; Lange, Ancient Kingdoms, 358-366; Olupona, 201 Gods'. ^ name="Blier Art and Risk"> Blier, Suzanne Preston (2015). Art and Risk in Ancient Yoruba: Ife History, Politics, and Identity c. 1300. Cambridge University Press. ISBN 978-1107021662. ^ Ajala, Olayinka & Olayiwola, Wale. (2013). An Assessment of the Growth of Ile-Ife, Osun State Nigeria, Using Multi-Temporal Imageries. Journal of Geography and Geology. 5. 10.5539/jgg.v5n2p43. ^ I.A. Akinjogbin, The Cradle of a Race: Ife from the Beginning to 1980 (Port Harcourt [Nigeria]:Sunray Publishers, 1992); William Bascom, The Yoruba of Southwestern Nigeria (New York: Holt, Rinehart and Winston, 1969); Frank Willett, Ife in the History of West African Sculpture (New York: McGraw-Hill, 1967); http://www.oauife.edu.ng/; http://www.historywiz.org/ife.htm; BBC: Ife and Benin; http://www.bbc.co.uk/worldservice/africa/features/storyofafrica/4chapter7.shtml. Akinjogbin, I. A. (Hg. ): The Cradle of a Race: Ife from the Beginning to 1980, Lagos 1992 (The book also has chapters on the present religious situation in the town). Blier,Suzanne Preston. Art and Risk in Ancient Yoruba: Ife History, Power, and Identity c.1300, Cambridge University Press 2015. ISBN 978-1107021662. Bascom, William: The Yoruba of south-western Nigeria, New York 1969 (The book mainly deals with Ife). --- "The Olojo festival at Ife, 1937", in: A. Falassi (ed. ), Time out of Time. Essays on the Festival, Albuquerque, 1987, 62-73. Frobenius, Leo, The Voice of Africa, London 1913 (Frobenius stayed for nearly two months in Ife, in 1910-11). Johnson, Samuel: History of the Yorubas, London 1921. Lange, Dierk: "The dying and the rising God in the New Year Festival of Ife", in: Lange, Ancient Kingdoms of West Africa, Dettelbach 2004, pp. 343–376. ---: "Preservation of Canaanite creation culture in Ife", in: H.-P. Hahn and G. Spittler (eds. ), Between Resistance and Expansion, Münster 2004, 125-158. ---: "Origin of the Yoruba and 'Lost Tribes of Israel'", Anthropos, 106, 2011, 579-595. Ogunyemi, Yemi D. (Yemi D. Prince), The Oral Traditions in Ile-Ife, ISBN 978-1-933146-65-2, Academica Press, 2009, Palo Alto, USA. ---: The Aura of Yoruba Philosophy, Religion and Literature, ISBN 0-9652860-4-5, Diaspora Press of America, 2003, Boston, USA. ---: Introduction to Yoruba Philosophy, Religion and Literature, ISBN 1-890157-14-7, Athelia Henrietta Press, 1998, New York, USA. ---: The Covenant of the Earth--Yoruba Religious & Philosophical Narratives, ISBN 1-890157-15-5, Athelia Henrietta Press, 1998, New York, USA. Olupona, Jacob K.: City of 201 Gods: Ile-Ife in Time, Space and Imagination, Berkeley 2011. Stride, G.T. and C. Ifeka: "Peoples and Empires of West Africa: West Africa in History 1000 - 1800", New York 1971. Walsh, M.J., "The Edi festival at Ile Ife", African affairs, 47 (1948), 231-8. Willett, Frank: Ife in the History of West African Sculpture, London 1967 (The book also deals with some oral traditions of Ile-Ife). Wyndham, John: "The creation", Man, 19 (1919), 107-8.